Have you ever stood in that long queue waiting to enter the Chepauk ground – there would be excitement in the air, one would have to show the ticket at more than a couple of places – security, Police and others would frisk you, one would have to pass through narrow barricades, contents checked, not allowed to carry water bottles ~ the spectator, the common man bears it all for his love for the game ! Back home, in a strange incident, a man drove his car onto the pitch during the Ranji Trophy match between Delhi and Uttar Pradesh at the Air Force ground in Palam on Friday afternoon. The man, who identified himself as Girish Sharma, 32, claimed that he had lost his way, and since there was no security at the entrance, he drove his vehicle, a Maruti Wagon R, onto the ground. Newspaper reports suggest that the incident occurred at 4.40 pm, 20 minutes from close of play. 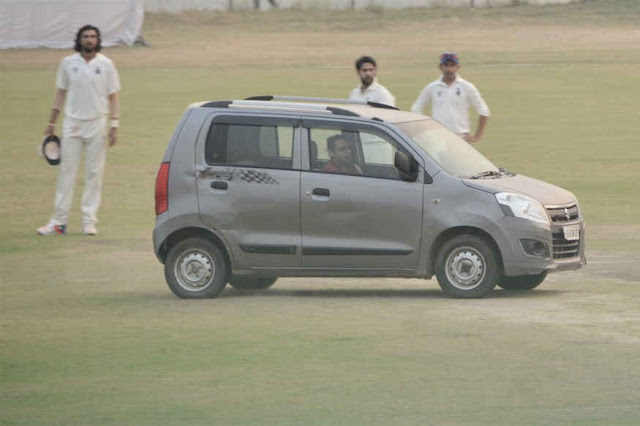 The unexpected entry of the vehicle startled both the players and umpires. As Sharma tried to drive away, he was caught by security officials and handed over to the Air Force Police. Thoda dar laga (Felt a bit scared), but there was no time to react, said Delhi all-rounder Manan Sharma. There was Gautam Gambhir, Suresh Raina, Ishant Sharma, Rishab Pant and others on the pitch when the security breach occurred. The venue for this match had to be shifted to Palam at the last minute because Feroz Shah Kotla was hosting the India-New Zealand Twenty20. The man claimed he didn't see any security and was merely lost, despite what looked like deliberate swerves to drive over the pitch twice, completely ignoring attempts from players and umpires to stop him. Justice Vikramjit Sen, the administrator in charge of DDCA, said that the issue was being sorted by the Services Control Board, which is in charge of the Palam ground. My hero Krish Srikkanth on his cricketing days was portrayed as a restless, especially after his habit of walking away from the crease, towards the square-leg umpire, cost him dearly in his debut test in 1981 against England in Mumbai; he nonchalantly strolled outside the crease when the ball was still in play. John Emburey swooped on the ball and ran him out. Do you remember that he was the captain in Pak 1989 tour when Sachin Tendulkar made his debut. That was a series troubled ~ ODI no. 594 had to be abandoned because of crowd behaviour. At Karachi, a spectator later identified as a calligraphist of an Urudu daily and a member of a religious fundamentalist group entered the field shouting slogans, gheroed Manoj Prabhakar, confronted Kapil Dev and tore the shirt of Krish Srikkanth. Though it was a physical assault, Indians chose to underplay the incident ! 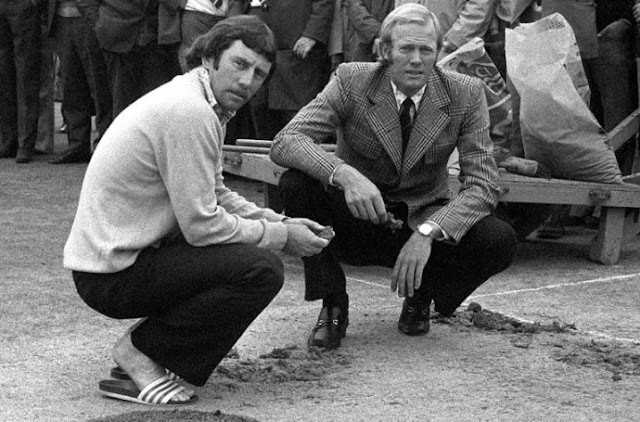 That last day of Headingley cricket ground in Leeds, - dawned cloudy, but when George Cawthray, the groundsman, pushed back the covers, he was greeted with the sight of a pitch which had been vandalised. Several lumps of soil had been gouged out of the surface just short of a length at the Rugby Ground End. While Cawthray later admitted that he could have repaired those sufficiently to allow play to recommence, what sent a chill down his spine was that the holes had been filled with about a gallon of oil. Cawthray found the solitary nightwatchman, who had not heard anything unusual, and then summoned the police. It was revealed that campaigners calling for the release of robber George Davis from prison had vandalised the pitch. The walls surrounding the ground were also daubed with slogans demanding the release of Davis, the east London minicab driver jailed for his part in an armed robbery. The campaigners' actions led to the final match between England and Australia being abandoned. It was declared a draw robbing the spectators of a good match, bringing an unnatural end to the Ashes series. Cricket is always interesting !